Our Ink Spray Tattoo Aftercare has been one of our most popular items - and we've just made it better! Ink Spray now has more precious essential oils and better astringent properties thanks to a higher quality Witch Hazel Extract. 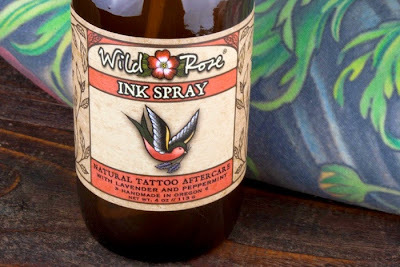 This simple spray relieves discomfort associated with healing tattoos and other skin abrasions. A gentle astringent base of organic Witch Hazel and Calendula Extract tighten pores to reduce bleeding and ink loss. Essential Oils of Lavender, Peppermint, Helichrysum and German Chamomile soothe tender, itchy skin and promote healing. For fresh tattoos, wash gently with a mild antibacterial soap 2-5 times per day. Pat dry with a clean paper towel. Lightly apply Ink Spray and allow to air dry. Ink Spray can be used alone for dry healing or in combination with our Ink Balm. We recommend applying Ink Spray prior to applying Ink Balm. Ink Spray can also be used in between washings to relieve discomfort and itching. We offer our tattoo aftercare at wholesale prices for tattoo artists and shops. Find a shop carrying Wild Rose products near you. If you are interested in offering our tattoo aftercare to your clients, contact us for a wholesale application.